Panafab Inc. is a team of designers and builders of fine custom equipment. We build medium to small systems. We fully assemble and de-bug these systems on our shop floor before delivering them to our clients. We provide complete and thorough documentation and support for the systems we build. Although we can adapt to the way you do business, this page describes how the process commonly unfolds. Developing a new piece of equipment starts by meeting with one or more of Panafabâ€™s development team. We often will come to your site to best understand your needs. Following this we will provide you with a detailed written proposal. This proposal will define the structure, function, timeline and cost of your new equipment. If the proposal is approved, the design phase begins. 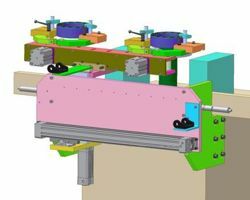 Using Auto-CAD Inventor, our design team creates a complete â€œvirtual modelâ€ of your new equipment. 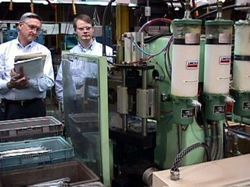 This technology lets you see and examine the design, in detail, on your computer, during any phase of the development. Electrical controls design is developed once the controls needs of the mechanical design are established. When you have approved the new design Panafabâ€™s machine builders take over. Under the control of our operations manager the team will begin making, purchasing, fabricating and assembling the parts to your machine. 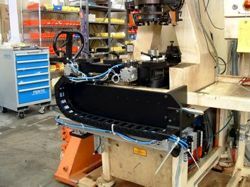 Your equipment is fabricated completely on site in our well-equipped shop. Final inspection and debug are completed prior to run-off. Run-off may be done at Panafab or at your facility. Complete satisfaction is the norm. The team at PANAFAB wonâ€™t let you down. Our team has a long reputation for satisfying their clients. Your new equipment will perform to specification. In addition you will receive a documentation package that is very detailed and accurate. This detailed documentation also allows us to support and help maintain your equipment over its lifetime.